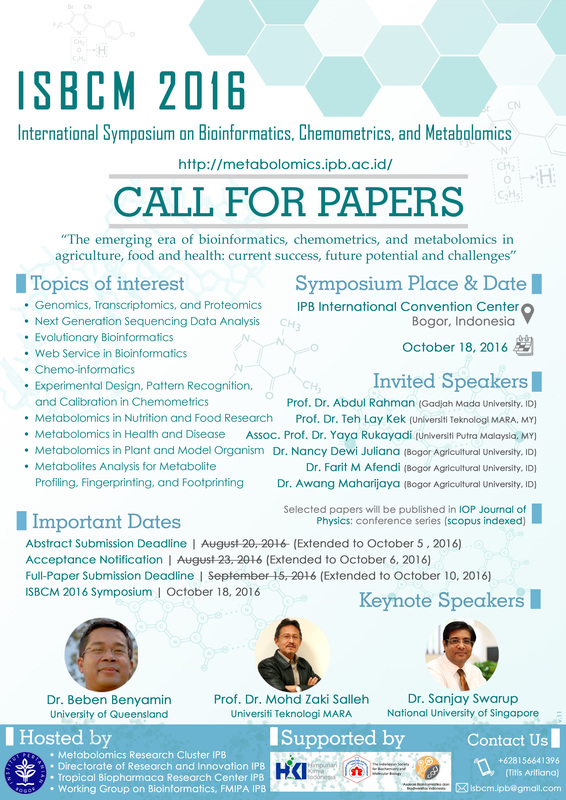 It is our pleasure to welcome you to the International Symposium on Bioinformatics, Chemometrics and Metabolomics (ISBCM) 2016. This symposium will be held for the first time in October 18, 2016 at IPB International Convention Center in Bogor, Indonesia. ISBCM 2016 will bring together researchers working on Bioinformatics, Chemometrics and Metabolomics (BCM), which are vibrant multidisciplined fields with positive trend in this decade. Metabolomics is an “advanced research” approach used to improve our understanding of metabolic systems and biochemistry compositions of plants and animals. Chemometrics is a science of how to extract information from chemical systems that can be applied to solve both descriptive and predictive problems in experimental life sciences. Bioinformatics refers to conceptualizing biology in terms of macro molecule (from in chemistry and physics points of views) then applying computational approaches from informatics (applied mathematics, computer science and statistics) in order to understand and manage molecular information in its macro scale. This year’s theme is The emerging era of bioinformatics, chemometrics, and metabolomics in agriculture, food and health: current success, future potentials and challenges. This conference embraces all aspects of BCM applications for solving real problems in food, health and agriculture. High quality, original papers are solicited in all areas of Bioinformatics, Chemometrics and Metabolomics.